Formatting headers and footers in Excel 2011 for Mac adds a distinctive appearance to your printed worksheets. You can also easily include important date and time information. You can work with headers and footers in Page Layout view by choosing View→Page Layout or clicking the Page Layout button in the Layout tab of the Office 2011 for Mac Ribbon. Move the cursor over the white space near the top of a page to add or format a header. Similarly, you can move the cursor over the white space near the bottom of a page to add or format a footer. A prompt appears, telling you to double-click if you want to add a header (or footer). Double-click in the white space. Headers and footers are divided into three distinct regions. You’re in the left, right, or center region, depending on where you double-click. Type your header or footer in the text provided. Click the Close button or press Esc on your keyboard to exit the Header/Footer dialog. When you’re entering or editing a header or footer, you can use the Header and Footer toolbar buttons to make things fancy. You can combine codes with text. 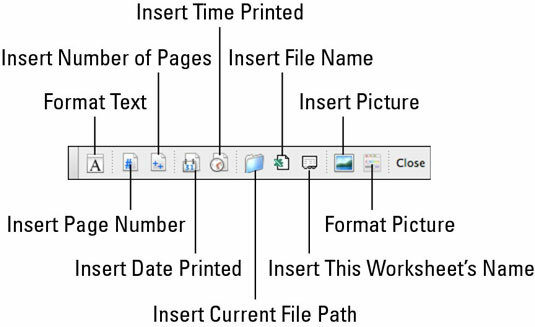 For example, use Insert Page Number and Insert Number of Pages with additional text like this: Page &[Page] of &[Pages] to print “Page # of #”. If you prefer the retro look of the old Header/Footer pane from previous versions of Excel, you can still access it by choosing File→Page Setup and then clicking the Header/Footer tab; you can also choose View→Header and Footer.